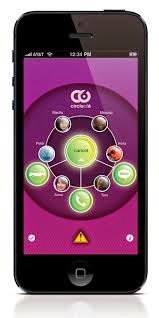 GEYC - Resources Center: Circle of 6 - You're out late and you lose track of your friends. Circle of 6 - You're out late and you lose track of your friends. This unique app is for those dangerous situations when you need to quickly (and discreetly) get help from your friends. Two quick taps sends one of three pre-written text messages to as many as six of your contacts. One message sends your GPS location and a request to be picked up, while another asks your friends to quickly get in touch with you. You're on a date that starts to get uncomfortable. You need a polite way to excuse yourself. Use Circle of 6 to alert your circle to call you and interrupt the situation. You're seeing someone new, but you have some doubts about how things are going. Use Circle of 6 to access a wealth of online information about healthy relationships. In critical situations, use Circle of 6 to call two pre-programmed national hotlines or a local emergency number of your choise.